2005-11-17. New. Ships with Tracking Number! INTERNATIONAL WORLDWIDE Shipping available. Buy with confidence, excellent customer service! 2013-01-09. New. Ships with Tracking Number! INTERNATIONAL WORLDWIDE Shipping available. Buy with confidence, excellent customer service! 2013-01-09. Good. Ships with Tracking Number! INTERNATIONAL WORLDWIDE Shipping available. May not contain Access Codes or Supplements. May be ex-library. Shipping & Handling by region. Buy with confidence, excellent customer service! Stevens Publishing, 2005-11-17. Paperback. Used:Good. 2005-11-17. Good. Ships with Tracking Number! INTERNATIONAL WORLDWIDE Shipping available. May not contain Access Codes or Supplements. May be ex-library. Shipping & Handling by region. Buy with confidence, excellent customer service! Stevens Publishing. PAPERBACK. 1885529678 New Condition. . New. Stevens Publishing. PAPERBACK. 1885529678 Like New Condition. . Fine. G. K. Hall & Company, 1999-05-01. Hardcover. Used:Good. G K Hall & Co. Hardcover. 0783885520 Like New Condition. . Fine. G K Hall & Co. Hardcover. 0783885520 New Condition. . New. Buccaneer Books, 1990-07. Hardcover. Good. London: Methuen London Ltd., 1983. Historical romance set in early 20th century England. 234 pp. Green cloth covered boards have as-new gilt text on spine only. Tiny bit of edge wear at head of spine. Unclipped (£ 7.95 in UK only), wraparound DJ has slight edge/shelf wear. Bookseller's Inventory # 180201.. First Edition. Green Cloth. Fine +/Fine. 8vo - over 7¾" - 9¾". Burman Press, 2013-01-09. Paperback. Good. New York: Harper & Brothers, 1929. Original blue cloth with red titles and illustrated endpapers. Stated first edition with the date on the title page. A clean, unmarked and tight copy, scarce in this condition.. First Edition. Hard Cover. Fine. Illus. by Photograph Frontispiece. Octavo. New York & London: Harper & Brothers Publishers. Very Good in Good dust jacket. 1929. First Edition. Hardcover. Dust jacket is good minus. DJ is missing the top spine end (with loss to title) and is missing a piece from the front upper edge. DJ has chips to the outer corners and to the lower spine end. DJ has a tear to the lower part of the front spine edge, with creasing to the adjacent spine and DJ front. DJ has slight smudging to the rear, some tiny edge tears, and is now in a mylar cover. .
Stevens Publishing, 2005-11-17. Paperback. Acceptable. New York: Grosset & Dunlap, 1929. hardcover. near fine. Colored frontis., 8vo, blue cloth stamped in silver. New York: Grosset & Dunlap, (1929). Early reprint edition. NY: Harper & Brothers. VG-. 1929. 1st Edition. Hardcover. First edition bound in blue cloth with orange lettering & orange picto rial endpapers. Frontis plate is missing. About VG copy. Has a mild ru b to the spine tips & corners. Front hinge exposed & a little soft whe re frontis plate was removed. Small blank plate on the front fly cover ing an old price. Otherwise clean & solid. .
New York: Grosset & Dunlap, 1929. Hard cover. Good in poor dust jacket. only discription flap of dj left shelf wear nice condition. 322 p. 20 cm. Audience: Children/juvenile. New York. : Grosset & Dunlap, , 1929. Hardcover. Very Good. 8vo - over 7¾ - 9¾" tall. Undated- copyright 1929-Other than gift inscription on end page this is a clean, tight and unmarked copy with attractive pictorial cover with no DJ- tinted top edge- frontispiece-sound binding. Harper & Brothers. Very Good with no dust jacket. 1929. Hardcover. A book that is used but still very attractive, no dustjacket, prior owners bookplate on front inside; Another famous story of LAD by the very famous writer of dog stories, Terhune . NY: Grosset & Dunlap Book has 1" wide line along the front/rear EPS hinges (vertical - top edge to bottom edge of EPS), top paper edges toned black, age toning (browning) on paper fore-edges and bottom paper edges. DJ 4 corners are lightly knicked, 1"(W)x1"(H) piece missing on bottom edge of DJ spine, two small (pen point size) pieces missing on top edge of DJ spine. 321pp + 1pp Afterword. Dark blue cloth with frontal profile of Lad on front cover along with crisp silver lettering on front cover and spine. Later Ed. Square, tight, bright copy with firm corners. No remainder mark. No internal names, notes or markings. Color Frontis. Crisp, unclipped pictorial DJ in Mylar cover ($1.00). 9 titles on rear panel of DJ. Very nice, bright copy. USPS Tracking provided. H. Later. Cloth. Almost Fine/Very Good +. Illus. by Illus. In Color & B&W. 8vo - over 7¾" - 9¾" tall. Children. New York: Grosset & Dunlap, 1929. Blue boards with silver lettering to front and spine. Bookplate on front flyleaf and gift note on half title page. Illustrated endpapers. . 322pp. Dust jacket is lightly rubbed and soiled; now in a new mylar cover.. Hardcover. Very Good/Very Good. 8vo - 8" - 9" Tall. New York: Grosset & Dunlap, 1929. Reprint Edition. In light blue cloth covers with blind-stamped Lad and dark blue lettering on front cover and dark blue lettring on spine. Blue stained top edge. Square, intact and tight binding. Clean and unmarked endpapers and text pages. Light bumping to ends of spine. Light shelf wear. Jacket:Intact. Small pieces missing on upper spine. Chipping on lower spine and edgers. Moderate shle rubbing. In new protective jacket cover. Photos upon request. . Hardcover. Very Good/Good. 8vo - over 7¾" - 9¾" tall. New York: Grosset & Dunlap, n.y.. Hardcover. Small 8vo. Blue cloth with blue pictorial gilt. 322pp. Frontispiece, pictorial endpapers. Very good. Tight, attractive reprint edition. New York: Grosset & Dunlap, 1929. c. 1950s, HB, embossed cloth boards with navy lettering, t.e.was green, deckled fore-edge, 322pp, blue/white illustrated epp. General rubbing, scuffing, to covers, diverse stains to all cornersand 50% of back board, inside has tanning to page edges, PO nams to epp and half-title pages, else square & tight.. Later Printing.. Hard Cover. Good/No Jacket. 12mo - over 6¾" - 7¾" tall. Grosset & Dunlap. Hardcover. This is a clean, straight old book with clean though tanned text pages and a decorative picture of collies on the front cover. Inside boards and end pages have a picture of three collies bounding toward a stream, and the frontispiece is a sleeping collie. The corners and spine ends are bumped. No dust jacket. . Good. 1929. New York: Harper & Bros, 1929. Covers worn and soiled; foxing to top and fore-edges, unmarked. Sound copy of a Terhune classic.. First American Edition. Blue Cloth. Fair/No Jacket. NEW YORK: GROSSET & DUNLAP. VG/FAIR ILLUSTRATED EPS. PREV. OWNER INSCRIPTION INSIDE. Pages: 322. . 1929. REPRINT.. HARDCOVER.. DJ EDGEWORN WITH SMALL TEARS, 1/4 PAGE CHIP TO FRONT, MISSING TITLE. PAGES CLEAN, BINDING TIGHT. . Condition: VG/FAIR ILLUSTRATED EPS. PREV. OWNER INSCRIPTION INSIDE. Pages: 322. Penguin Publishing Group, 1980. Mass Market Paperback. Good. Disclaimer:A copy that has been read, but remains in clean condition. All pages are intact, and the cover is intact. The spine may show signs of wear. Pages can include limited notes and highlighting, and the copy can include previous owner inscriptions. At ThriftBooks, our motto is: Read More, Spend Less.Shelf and handling wear to cover and binding, with general signs of previous use. Minor shelf and handling wear, overall a clean solid copy with minimal signs of use. Secure packaging for safe delivery. Secure packaging for safe delivery.Dust jacket quality is not guaranteed. New York: Grosset & Dunlap. Very Good with no dust jacket. 1929. Hardcover. 5 1/4 x 7 3/4 ; 321 pages; Blue hard cover has light rubbing, bumping, scuffing, sunning; very faded spine. Missing DJ. Some foxing to pages. Brown and white monochrome end papers. Black and white frontispiece. 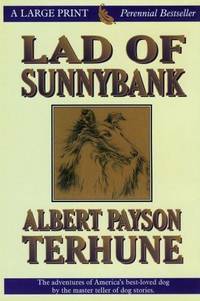 A wonderful book about the founding sire of the Sunnybank collie dynasty. .
New York: Grosset & Dunlap. Very Good with no dust jacket. 1929. Hardcover. Light blue hardcover with black lettering and embossed design of collie on cover. Illustrated endpapers. Illustration of Collie dog on tittle page. Published by Grosett & Dunlap but no mention of arrangement with another publisher, which usually theu do with all their reprints. Light wear to cover edges, spine color faded. ; 8vo - over 7¾" - 9¾" tall . Harper & Brothers, 1930. Book. Acceptable. Hardcover. 8vo - over 7¾" - 9¾" tall. First Edition. Boards are square with lightly bumped corners and fraying atop spine. Ex-library with stamps and remnants of removed pocket. No jacket..
New York: Grosset & Dunlap, 1929. Light edgewear. Light soiling. Bumped corners. Book cocked. Light browning. Inside hinge is creased. . Hard Cover. Good/No Jacket. 12mo - over 6¾" - 7¾" tall. New York: Grosset & Dunlap, 1929. Hard cover. Fair in poor dust jacket. 322 p. 20 cm. Audience: Children/juvenile. New York: Grosset & Dunlap. Fiction: Story of a Collie Dog named Lad. Reprinted. No Date. Hardcover, NO jacket. Blue cloth has dog face blind stamped on front cover. Navy blue lettering.Tinted top edge. Navy and white Illustrated endpapers. 321pp. Clean interior, tight hinges. **flaws: Book spine is sun-faded, and there is light silver fish fading on covers. Good / NO dj.. Hardcover. Good+/No Jacket. G. K. Hall & Company, 1999-05. Hardcover. Good. New York: Grosset & Dunlap, 1929. Pictorial boards are scuffed with rubbed edges. Pages are clean with no markings in text. Later printing. Illustrated end pages. . Hard Cover. Good/No Jacket. 8vo - over 7¾" - 9¾" tall. New York: Grosset & Dunlap, 1929. Wear to corners, light rubbing, tears to two pages; unmarked. Nice copy of a 1960s reprint of a classic title.. Reprint. Pictorial Cover. Very Good/No Jacket. Grosset & Dunlap. Used - Good. Good condition. Acceptable dust jacket. Slightly dampstained. NY: Grosset & Dunlap, 1929. 321pp. Pictorial endpapers. Frontispiece. Corners bumped and rubbed through. Gift inscription on the verso of the front free endpaper. Boards unevenly faded. Sticker ghost to a blank prelim. . Reprint. Original Cloth. Good/No Jacket. 12mo - over 6¾" - 7¾" tall. USa: Grosset & Dunlap. Hardcover. Good. Wear to edges, spotting on covers, white spot near head of front cover. Good. New York: Harper Perennial Libary, 1966. very good in softcover; ALL ORDERS SHIPPED WITH DELIVERY CONFIRMATION;. 1st Paperback Edition. Softcover. Very Good/No Dustjacket. 4 x 7". Grosset & Dunlap. Hardcover. B0006AQPVW Missing dust jacket. Meets the acceptable condition guidelines. Has wear. Five star seller - Buy with confidence! . Fair. G K Hall & Co. Hardcover. GOOD. Spine creases, wear to binding and pages from reading. May contain limited notes, underlining or highlighting that does affect the text. Possible ex library copy, thatâll have the markings and stickers associated from the library. Accessories such as CD, codes, toys, may not be included.